ShopScanner | TeckNet Laptop Cooling Pad, Portable Ultra-Slim Quiet Laptop Cooler With 2 Fans, 2 Extra USB Ports, Fits 9"-16"
TeckNet N5 Anywhere keeps your laptop cool by preventing heat build up. The pad's dual intake vents and curved shape mean you can use your laptop on both hard and soft surfaces without worrying about cutting off the computer's air supply. TeckNet's AirFlow Wave Design also makes for a whisper-quiet fan that won't interfere with the audio of your music, movies and games. 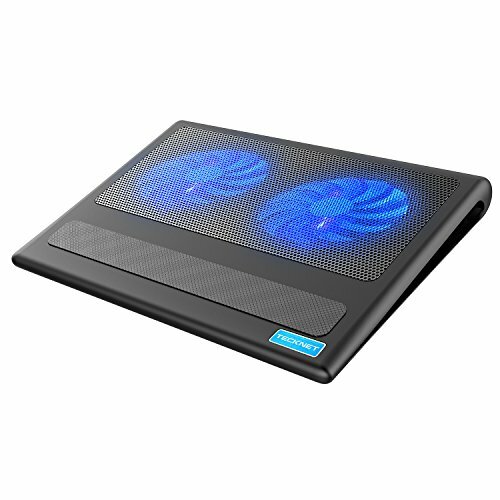 This laptop cooling pad is designed to create superb comfort for all laptop users. It supports a variety of laptop sizes up to 16'', and the extremely sturdy polished metal mesh provides a stable surface for you to enjoy working on the computer.